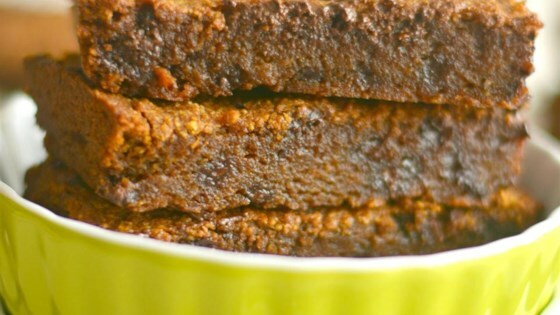 "Ooey, gooey pumpkin chocolate coconut oil bars! These gluten-free, paleo bars are a melt-in-your-mouth treat." Preheat oven to 350 degrees F (175 degrees C). Grease a 9x9-inch baking pan or glass dish with cooking spray. Combine almond flour, coconut sugar, pumpkin puree, coconut oil, dairy-free chocolate chips, tapioca flour, egg white, pumpkin pie spice, cinnamon, and almond extract in a bowl; stir until well mixed. Pour into prepared baking pan. Bake in the preheated oven until chocolate chips are melted and top is golden brown, about 30 minutes. Cool until set, about 15 minutes. Cut into bars. I added a few chocolate chips to the top of the bars when they came out of the oven, and they melt, adding extra gooey goodness. I also use a plastic knife to cut bars, so they cut nicely and don't crack.